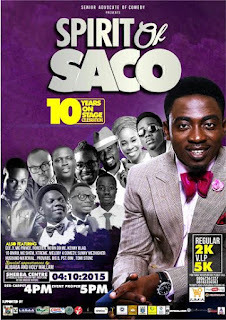 Christian Media in Nigeria : SACO To Celebrate 10 Years On Stage with "The Spirit Of SACO"
SACO To Celebrate 10 Years On Stage with "The Spirit Of SACO"
Okundalaiye Ayodele, popularly known by fans as SACO (Senior Advocate of Comedy) will be celebrating 10 years on stage as a comedian and host with the event themed "The Spirit of SACO". Saco, who has been featured on numerous television shows/events including NTA’s AM Express, the Teju Babyface show, RCCG Kingsborough London, RCCG Victory Center Plumstead common London, and African Gospel Award London, to mention a few has been very dedicated since inception and has risen in the industry over the years. Comedy and music acts such as Nosa, PITA, Tope Alabi, Emma Oh My God, MC Shem, Kore and many more will join SACO on the 4th of October to celebrate an eventful and rewarding decade on stage. The event is expected to have in attendance notable clerics, industry giants, distinguished personalities, comedians, artistes and fans. VENUE: Sheba Centre, Plot 20, Mobolaji Bank Anthony way, Ikeja, Lagos State.